Were it simply handed to you, you’d think it was a slightly large and heavy flashlight. And it does have a very powerful and versatile flashlight function. But this cylindrical object is more than a light source. It’s JumpSmart, which also is a power bank strong enough to jumpstart a vehicle with an engine as large as 3.0 liters, let alone a cell phone or laptop. Next came ChargeHub, a puck-like device with multiple USB charging ports that won Best of CES honors at the Consumer Electronics Show. 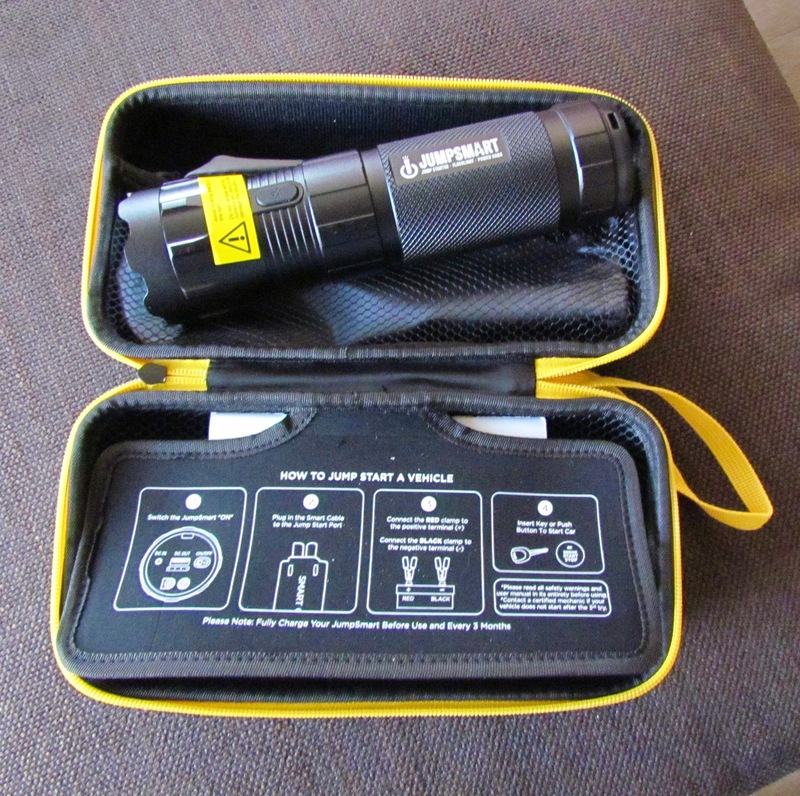 To its array of products designed for home and office use, the company has added those for people on the go and thus the JumpSmart, which combines a 1,100-lumens flashlight with four illumination modes with a power bank with a USB port with a jump starter with enough power to bring a 3.0-liter gasoline or 2.0-liter diesel engine back to life. The unit also works with motorcycles or boat engines. With the flashlight at one end, the other end of the JumpSmart provides a covered panel with an on/off switch to limit electric drain, a set of lights to indicate the degree of charge in the unit, a USB port and plugs to power up the unit or to send its power to a vehicle battery. JumpSmart comes in a protective case that fits in a glove compartment or similar storage cubby of a vehicle. Included is the JumpSmart, its protective sleeve, smart cable safe-vehicle jumper cables, a charger so the unit can be recharged from a wall outlet or the typical vehicle power port. There’s also a user manual, plus “how to jump start a vehicle” instructions are printed inside the case.